The flash in the IPhone phone appeared relatively recently. Only starting from the fourth generation model, she became an assistant in creating photos using the phone. Prior to this, each user had the opportunity to buy an additional element that allowed to use the flash. Now the flash allows a lot of operations in the IPhone phone. If you turn it on, it can perform the function of a flashlight, creating an additional backlight. But on this its functions are not limited. Now in these phones, it can give a light signal when calling the device. 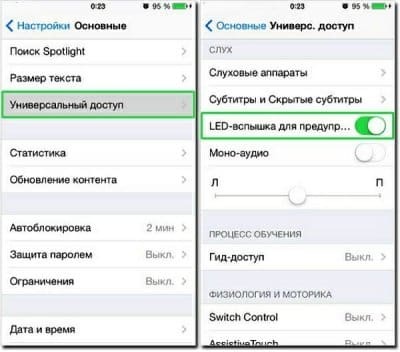 When the flash is turned on, the IPhone user can not only hear the melody, but also visually get information about the call to the device. This will flash the flashlight. To activate the flash, you need to enable on your IPhone phone a special application called “Settings”. Then we find a subsection with the name "Basic". As can be seen from the presented image, this subsection is located first in the list above. Therefore, the user will not be difficult to find it. The next step will be to find and enable in the above subsection of the menu item called "Universal Access". This procedure is illustrated in the figure below. Now you can go to the final stage. In this menu item, select the section "LED-flash for warnings" from the prepositional list. To do this, as can be seen from the figure above, you need to move the cursor on the screen to the active position. You can do this by simply touching your finger. At this point, the procedure for connecting the flash to the bell will be over. When an incoming call should be flashing diode. It is easy to check. You just have to make a phone call from another device. Also, the flash will react when the alarm is set on the phone. When you receive a message on the device, you can also see the flash flash. Using the flash on the phone as an additional tool for signaling a call, you need to take into account some feature. In this mode, the device can consume more energy. Therefore, it will have to be charged more often, otherwise it will simply turn off at the most inopportune moment. I draw your attention that the flash on the iPhone when you call will periodically light up only if the iPhone screen is locked.